How a quantum number that made no physical sense turned out to be real… and irreplaceable. In the early 1920s, physicists were first working out the mysteries of the quantum Universe. Particles sometimes behaved as waves, with indeterminate positions, momenta, energies, and other properties. There was an inherent uncertainty to a great many properties that we could measure, and physicists raced to work out the rules. Amidst this frenzy, a young Dutch researcher named George Uhlenbeck implored Paul Ehrenfest, his research supervisor at the University of Leiden, not to submit the paper he wrote with Samuel “Sam” Goudsmit about a new quantum number called spin. It was not correct, Uhlenbeck told him in a frenzy. Let’s just drop it and start over, he implored. Uhlenbeck and Goudsmit, both then in their mid-20s, had just showed their joint result to the great Dutch physicist Hendrik Lorentz who had found what seemed like a major error. Electrons, he pointed out, couldn’t possibly rotate fast enough to generate the magnetic moment (interaction strength between a particle and an external magnetic field) that the duo had predicted. The particles would need to whirl faster than the sacred speed limit of light. How could they? The spin paper is unphysical, Uhlenbeck told Ehrenfest, and should not be published. Electrons, like all spin-1/2 fermions, have two possible spin orientations when placed in a magnetic field (CK-12 Foundation / Wikimedia Commons). Ehrenfest’s words certainly weren’t comforting. Surely, Uhlenbeck didn’t want to start off his career with a foolish error. Luckily, however, the spin quantum number, interpreted abstractly and having nothing whatsoever to do with rotation despite its name, has become an essential feature of modern physics. Electrons somehow acted in a magnetic field as if they were whirling, even thought they really couldn’t be. Uhlenbeck and Goudsmit’s roulette wheel bet on a weird new concept had paid off handsomely. Thomas precession demonstrated with a gyroscope in space, as in the Gravity Probe B experiment (NASA). One of the harshest critics of spin was the acerbic physicist Wolfgang Pauli. Pauli, like Ehrenfest was born in Vienna, and moved elsewhere for his career. Like Lorentz, Pauli believed at first that spin was unphysical. (In January 1925, German American researcher Ralph Kronig had made a similar suggestion to Pauli, which he had immediately rejected and was never published.) He changed his mind only after Llewellyn Thomas demonstrated a phenomenon called “Thomas precession” that examined spin using special relativity. Pauli and Ehrenfest shared a blunt demeanor and willingness to criticize others in matters of science. They had first met in 1922 at the “Bohrfestspiele” (celebration of Niels Bohr’s work around the time of his Nobel Prize ) in Göttingen, Germany. Pauli, then in his early 20s, was already famous as a “wunderkind” for an excellent article about general relativity that appeared in a scientific encyclopedia edited by German physicist Arnold Sommerfeld. Ehrenfest and his wife had contributed a piece on statistical mechanics for the same volume. Pauli and Ehrenfest’s initial conversation centered on those respective works. In an atom, each s orbital (red), each of the p orbitals (yellow), the d orbitals (blue) and the f orbitals (green) can contain only two electrons apiece: one spin up and one spin down in each one (Libretexts Library / NSF / UC Davis). Quantum states in atoms (such as hydrogen) can be characterized by quantum numbers denoting the properties of an electron occupying such a state. The principal quantum number, introduced by Bohr, described the energy of an electron due to its electric interaction with the nucleus. The second and third quantum numbers, introduced by Sommerfeld, pertained to aspects of an electron’s angular momentum (a measure of the shape and configuration of its orbit). Traditionally, each of those quantum numbers were integers — counting numbers denoting a finite set of possibilities, such as the seat and row numbers in an arena. In tandem, those three quantum numbers determine how the probability clouds representing the electrons position themselves in the “stadium” surrounding the nucleus. 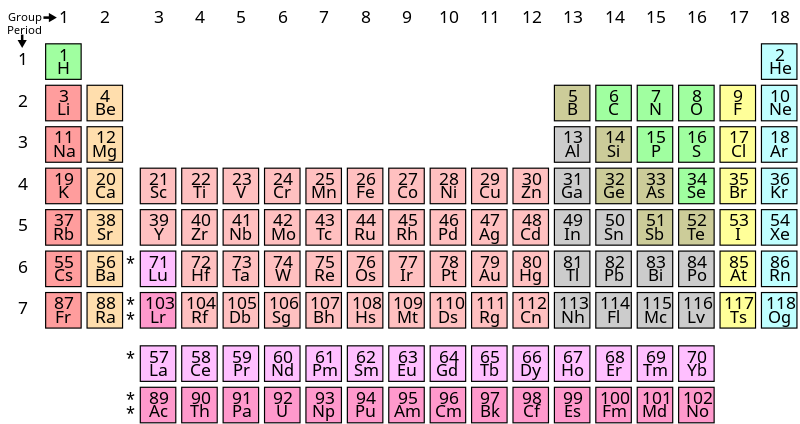 That intricate pattern, well known by chemists, helps explain the periodic table. Hydrogen density plots for an electron in a variety of quantum states. While the three quantum numbers of charge and angular momentum in two different dimensions could explain a great deal, ‘spin’ must be added to explain the periodic table and the number of electrons in orbitals for each atom (PoorLeno / Wikimedia Commons). However, as Goudsmit realized in May 1925, there was a problem with using pure integers to characterize the quantum states. If you did, the exclusion principle couldn’t be maintained. Two electrons in the ground state (lowest energy level) of an atom would have identical set of those three quantum numbers. Goudsmit found that by introducing a fourth quantum number, representing a kind of intrinsic or extra angular momentum, that could take on only one of two possible values — either +½ or -½ — he could preserve the Pauli exclusion principle. The ground state could still have two electrons, but their fourth quantum numbers would be opposite: if one was +½, the other would be -½. In the absence of a magnetic field, the energy levels of various states within an atomic orbital are identical (L). If a magnetic field is applied, however (R), the states split according to the Zeeman effect. Here we see the Zeeman splitting of a P-S doublet transition (Evgeny at English Wikipedia). Introducing a half-integer quantum number without physical justification was a rather audacious move. In a stadium concert, if an agency issued two tickets for the same seat A11 by labeling them A10½ & A11½ that would seem like chicanery. In hindsight, Goudsmit freely admitted that his physical understanding was not developed enough to justify such a move. He was working part time with Pieter Zeeman on atomic spectral lines, but had yet to see the connection. Zeeman had found extra spectral lines when an atom was placed in a magnetic field for which there was no explanation. Luckily Ehrenfest paired Goudsmit with Uhlenbeck, who knew a greater deal of foundational physics. Graph showing the Zeeman splitting in Rb-87, the energy levels of the 5s orbitals, including fine structure and hyperfine structure (Danski14 / Wikimedia Commons). Uhlenbeck learned from Goudsmit about the anomalous spectral lines as well as his theory of a half-integer quantum number and brilliantly connected the two ideas. The fourth quantum number, Uhlenbeck pointed out, made sense if the electron generated its own magnetic field like a spinning ball of charge. If it was a mini-magnet that could spin either clockwise or counterclockwise, it would have two different energy states in the presence of an external magnet — either aligned or anti-aligned — which would explain the split in spectral lines. Goudsmit was convinced. They wrote up their results and gave them to Ehrenfest, who promptly submitted them to a journal. The young physicists were lucky that Ehrenfest could be impulsive. If he had discussed the spin idea with others, probably few in the physics community (except, potentially, for Werner Heisenberg, who was also thinking about half-integer quantum numbers) would have supported it. But once it was published, and the spin idea was re-interpreted as an abstract quantum number, it seemed the perfect way of understanding Pauli’s exclusion principle. Integer “stadium seating” for electrons was out, half-integer was in. When they left Leiden, Uhlenbeck and Goudsmit conducted a different kind of experiment, dubbed the “Michigan experiment,” when they both took on roles as Assistant Professors at the University of Michigan at the same time. They even collaborated on training graduate students, including Dutch physicist Max Dresden (who would become the research supervisor of this author and carry on the pedagogical tradition handed down by Ehrenfest, Uhlenbeck, and Goudsmit.) Open-minded inquiry was the hallmark of that school of thought — which splendidly led to the important concept of spin. It’s the sort of physics advance that Sauron might appreciate. The villain in J. R. R. Tolkien’s fantasy trilogy, The Lord of the Rings, gives the kings of men, elves, and dwarves magic rings, but then forges a single ring that controls all the others. In a similar way, a duo of theoretical physicists has come up with a way to transform all the disparate members of a vast family of complex systems known as spin models into different shades of a single simple model, which now serves as the one to rule them all. Spin models were invented to explain magnetic materials, such as iron and nickel. Those metals can be magnetized because each of their atoms acts like a tiny bar magnet. At high temperatures, the jiggling atoms point in random directions and their magnetic fields cancel one another. However, below the so-called Curie temperature, the material undergoes a “phase transition” much like water freezing into ice, and all the atoms suddenly point in the same direction. That alignment reduces the atoms’ total energy and makes their magnetic fields add together. Because each atom’s magnetism originates from the spin of an unpaired electron within it, models of how magnetism arises are known as spin models. The Ising model was the first spin model, invented in 1920 by German physicist Wilhelm Lenz, who gave it to his student Ernst Ising to analyze. In it, each atom is a simple object that can point either up or down. Each spin flips randomly with thermal energy, but it interacts with its neighbors so that each pair of spins can lower its energy by pointing in the same direction. Each spin can also lower its energy by aligning with an externally applied magnetic field. The coupling between each pair of spins can be different, as can be the external field applied to each spin. Ising hoped to show that below a certain temperature the spins would undergo a magnetic phase transition. However, he could “solve” only the 1D Ising model—a single string of spins—and found it had no phase transition. Ising speculated that the 2- and 3D cases wouldn’t, either. Then in 1944 the enigmatic Norwegian-American chemist Lars Onsager solved the Ising model with uniform couplings and no external fields on a 2D square pattern of spin. The famously incomprehensible Onsager, who won the 1968 Nobel Prize in Chemistry for earlier work but also lost two faculty jobs, showed that the 2D Ising model does have a phase transition—the first seen in a theoretical model. Onsager’s tour de force calculation is now legendary, although he published it only 2 years after the fact. The 3D Ising model is still unsolved. Meanwhile, spurred in part by Ising’s difficulties, physicists invented plenty of other spin models. Instead of up and down, the spins can have, say, five possible settings, or like compass needles can point in any direction. The spins might also interact in groups larger than pairs and with spins far beyond their neighbors. Spin models have found use outside physics. For example, the spread of an epidemic might be simulated on a spin model with spins having three states corresponding to well, sick, and recovered. “Spin model is a really bad name for something that’s a lot more general,” says Gemma De las Cuevas, a theoretical physicist at the Max Planck Institute of Quantum Optics in Garching, Germany. But all those disparate spin models can be transformed into the good old 2D Ising model, De las Cuevas and Toby Cubitt, a theorist of University College London, report online today in Science. Crudely their proof works as follows. First, the two scientists note that the up-or-down Ising spin resembles the true-or-false character of a logical statement such as “the car is white.” They then prove that any particular 2D Ising model—i.e., with a particular set of coupling and external fields — is equivalent to an instance of a logical problem called the satisfiability, or SAT, problem, in which the goal is to come up with a set of logical statements, A,B,C, … that satisfy a long logical formula such as “A and not (B or C) …” The theorists present a way to map the SAT problem onto the 2D Ising model. Next, they show how any other spin model can also be translated into a SAT problem. That SAT problem can then be translated onto the 2D Ising model, thus making the two spin models equivalent. There is a price to pay, however. The 2D Ising model must have more spins than the original spin model. But De las Cuevas says that the computational demands of the Ising model are only modestly bigger than those of the original model. “If you could explain all of the parameter regions of the 2D Ising model with fields, that would be equivalent to probing all possible spin models,” she says. The advance might also make into the textbooks. The Ising model is introduced in statistical mechanics courses as the simplest spin model. Future texts might also note that in spite of its simplicity, it can reproduce all other spin models. In a sense, it’s all you need to know. Wolfram Fischer stands next to the electron lensing apparatus at the Relativistic Heavy Ion Collider (RHIC). A schematic diagram showing the components appears below. Accelerator physicists at the U.S. Department of Energy’s (DOE) Brookhaven National Laboratory have successfully implemented an innovative scheme for increasing proton collision rates at the Relativistic Heavy Ion Collider (RHIC). More proton collisions at this DOE Office of Science User Facility produce more data for scientists to sift through to answer important nuclear physics questions, including the search for the source of proton spin. 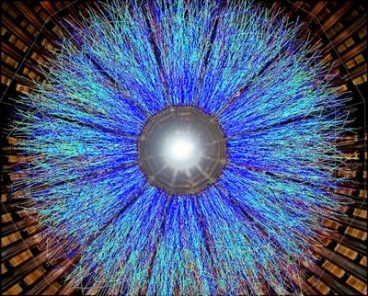 “So far we have doubled the peak and average luminosity—measures that are directly related to the collision rates,” said Wolfram Fischer, Associate Chair for Accelerators of Brookhaven’s Collider-Accelerator Department and lead author on a paper describing the success just published in Physical Review Letters. And, he says, there’s potential for further gains by increasing the number protons from the injectors even more. RHIC is the world’s only polarized proton collider, capable of sending beams of protons around its 2.4-mile-circumference racetrack with their internal magnetic axes (also known as spins) aligned in a chosen direction. Colliding beams of such “spin polarized” protons and manipulating the spin directions gives scientists a way to explore how their internal building blocks, quarks and gluons, contribute to this intrinsic particle property. Data at RHIC have revealed that both quarks and gluons make substantial contributions to spin, but still not enough to explain the total spin value. More data will help resolve this spin mystery by reducing uncertainties and allowing nuclear physicists to tease out other unaccounted for contributions. But getting more protons to collide is an ongoing challenge because, as one beam of these positively charged particles passes through the other, the particles’ like charges make them want to move away from one another. The size of the repulsive kick depends on where the proton flies through the beam, with protons about halfway from dead center to the outside edge of the beam’s cross-section experiencing the largest outward push. Particles closer to the center or the outer edge of the cross-section experience less repulsion. Because of the variable shape of this effect—increasing to a peak and then decreasing with distance from the beam’s center—it’s impossible to correct using magnets. “The magnetic field strength in magnets increases steadily from the center out,” Fischer said. So instead, the scientists turned to using oppositely charged particles to produce a compensating push in the opposite direction. “We’ve implemented electron lensing technology to compensate for these head-on beam-beam effects,” Fischer said. Essentially, they use an electron gun to introduce a low-energy electron beam into a short stretch of the RHIC accelerator. Within that stretch, the electrons are guided by a magnetic field that keeps them from being deflected by the more energetic protons. As the protons pass through the negatively charged electron beam, they experience a kick in the opposite direction from the repulsive positive charge, which nudges the protons back toward the center of the beam. The scientists also take advantage of certain “optical” properties of RHIC’s particle beams to ensure the method’s efficacy. “Ideally you would like to produce these compensating pushes right where the collisions happen, within the STAR and PHENIX detectors,” Fischer said. “But then the experiments wouldn’t work anymore. The electron lensing team (front row, left to right): Xiaofeng Gu, Peter Thieberger, Wolfram Fischer, Zeynep Altinbas, Yun Luo, (back, l to r) Chuyu Liu, Alexander Pikin, Al Marusic, Jon Hock, Mike Costanzo. Additional co-authors on the electron lensing paper not shown: Rob Michnoff, Toby Miller, Vincent Schoefer, and Simon White. Like a wave of light or sound that oscillates up and down in amplitude at a given frequency, the particles that travel around RHIC also oscillate a tiny bit. As long as the nuclear physicists know the frequency of the oscillations and give their electron-lensing kicks at the same point in that oscillation that the particles reach within the detector, the effect will compensate for the proton repulsion the particles experience at that distant location. So far, the scientists have doubled the proton-proton collision rates at RHIC. They could potentially get even higher gains by increasing the number of protons injected into the machine. “The key challenge will be to maintain the high degree of polarization the experiments need to explore the question of proton spin,” Fischer said. But he insists there is clear potential for even higher proton-proton luminosity. This work was performed by many people in the Collider-Accelerator Department and the Superconducting Magnet Division at Brookhaven National Laboratory, and was funded by the DOE Office of Science (NP). The scientists also acknowledge the U.S. LHC Accelerator Research Program (LARP) for support of beam-beam simulations, and researchers around the world especially the electron lens experts at Fermi National Accelerator Laboratory.